Responsible for managing the countryside of Tameside, the Service relies on the support and commitment of a team of voluntary rangers, without whose help, the level of service could not be maintained. 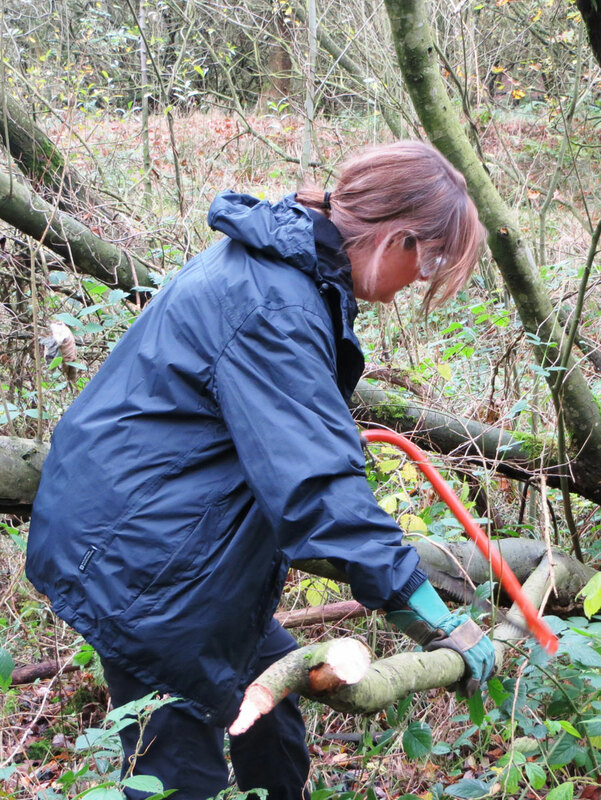 Voluntary Rangers are people of all ages, ability and from all social backgrounds who are interested in helping to look after the countryside of Tameside. They work closely with the full time Ranger Service and provide an important link with local communities. What do Voluntary Rangers do? Every year hundreds of hours are spent by volunteers undertaking a wide variety of tasks, both at weekends and midweek. Many different types of projects are tackled, usually of high conservation or amenity value. It is by no means all physical and there is something for everyone! Patrolling, walking and checking footpaths and bridleways. Footpath and bridleway clearance and improvement. Leading guided walks - or bringing up the rear! Local Nature Reserve management and habitat protection. Stile, step and footbridge rebuilding. Hedgelaying, fencing and dry stone walling. Litter picking and rubbish collection. Tree planting and woodland management. Karen has been a Greenspace Volunteer for almost two years. This is her account of why she started and what she enjoys about it. “I am not quite sure exactly what made me decide I wanted to try my hand at volunteering; I don’t have loads of time on my hands as I work full time but I just wanted to try something different. I love being outdoors so volunteering for Tameside Greenspace seemed like a good idea. As I wasn’t quite sure what to expect I was a little nervous initially but needn’t have worried, it was fantastic and everyone made me feel welcome, even got a cup or two of tea. I have been volunteering for a while now and reflecting on it so far I feel that I benefit in several ways, first and foremost is being outdoors. In recent years there has been lots of interest and research into the benefits of being outdoors. Research promotes benefits such as better physical health including increased strength and stamina and weight loss through to reduced stress levels and overall improved mental well being. I am not sure I really needed all the research to tell me that being outdoors was good for me, it just feels intuitive, makes me feel like I am part of something bigger. This in turn makes me feel more connected and less likely to stress about things. It is just so lovely to be out in the fresh air, listening to the birds and learning about the amazing wildlife we have on our doorstep. The benefits that I have noticed not only include feeling more calm and relaxed but also that I feel better physically after being out volunteering. I can honestly say that I am no big fan of exercise per se, the thought of the gym fills me with dread but I do enjoy and feel so much better for exercise. When I have been out on the conservation days I feel I have worked off more calories than any gym session or exercise class and believe me I have tried many. A day balsam bashing or coppicing must work off enough for at least a piece of cake whilst also toning up arms and legs and it's way more interesting than the gym, not to mention easier on the purse. 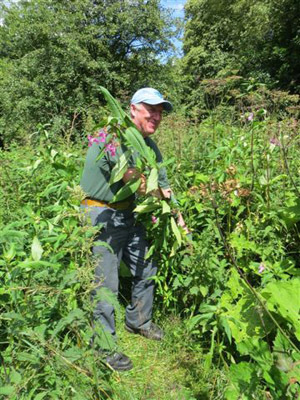 So far I have had a chance to get involved with tasks ranging from tree planting, hedge laying and coppicing through to clearing invasive species such as Himalayan Balsam. I wouldn’t say that I had any previous experience other than trying to sort out my own garden. I was a little worried that I would be more of a hindrance than a help but with excellent guidance (and patience) from the Greenspace Development Officers and the other volunteers I feel more confident. Its a privilege to learn from them with their wealth of knowledge and skills. There are over 20 parks in Tameside, many of which have 'friends groups'. These usually consist of local residents who have a pride in their own locality and want to promote opportunities to enjoy the park and help in the upkeep. Join us for a coffee and chat at Portland Basin Museum at 10.30 to 12.00 on Tuesday 30 April. Alternatively you can send us a message using the contact details below explaining why you would like to become a voluntary ranger. Please include as much info as possible such as your interests and skills or experience which may be useful and any particular aspects of the work that interest you.